I expect that most of you have found yourselves discussing some given game with a friend only to share (or hear about) this amazing thing that proves just why the title is so special. This has happened to me a dozen times and more; it’s even led to a few of my friends purchasing the game for themselves after a particularly engaging conversation, which might be in no small part to my unrelenting hype over technical advances in game engines. This is the first in a planned series of feature articles that talk about some central concept that flips established convention and pivots the series in a new direction. First up? Far Cry 2. 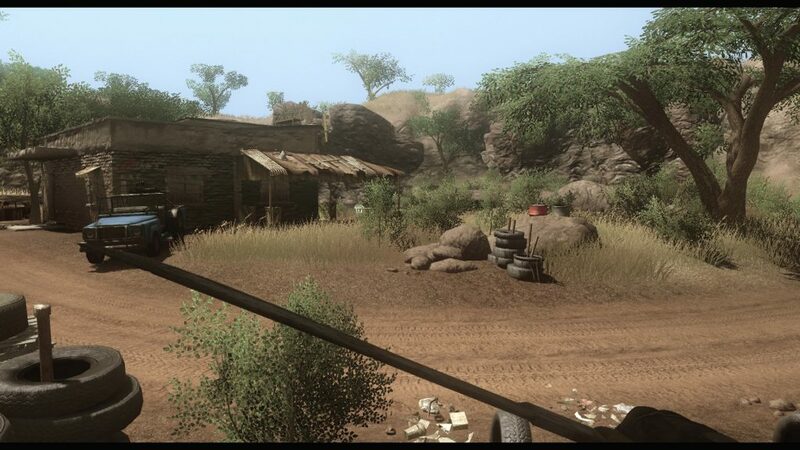 Admittedly, my Xbox 360 has been packed up and stuffed into a closet for quite some time, but thanks to Far Cry 2‘s recent inclusion to the Xbox One Backwards Compatability Program, I was able to load up the game and explore the savannah once again to refresh my memory and grab screenshots while I was at it. Of all the excellent reasons that someone should find themselves engrossed in the Far Cry games, what first introduced me to the series was Far Cry Instincts’ map editor. My younger brother had been off at his friend’s house, played the game, and came home ecstatic with how he’d built how own multiplayer map. As we took the family dog for a walk, they filled the time by sharing their experience in building the map (literally) from the ground up; raising / lowering ground features, placing buildings, flora, weapons, ammo, and (surely) a healthy portion of Exploding Red Barrels. Being the resident gamer in my family, it was a little bit strange to have my brother ‘sell’ me on a game (as opposed to the other way around), but the story did resonate with me as I’d always wanted to try my hand at making some multiplayer arenas of my own (for example, I loved the map editor in the old Age of Empires and Starcraft titles). My next stop into EB Games I picked up a copy of Instincts based solely upon my brother’s testimony, and fell in love with it all – the map editor, surely, but the greater picture that Crytek painted as well. It was my first experience with such an expansive shooter (save for Halo‘s lengthy levels), and I’d never encountered ‘ragdoll’ physics on enemies before. I was hooked. But then, Far Cry 2 discovered fire. Speaking to those unfamiliar with Far Cry 2, I like to advertise that it truly refined the mechanics presented in both Instincts (and the spin-off sequel, Evolution). Thematically, the games couldn’t be further apart from one another, and many questioned why FC2 continued to bear the ‘Far Cry‘ moniker with such a radical departure from the story of Jack Carver (protagonist of the three prior games). 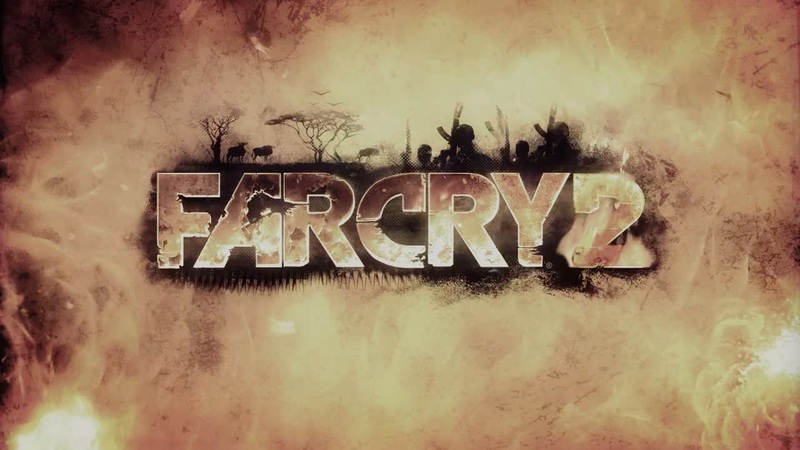 As it turns out, however, this sequel was the first step toward an open-world rebranding of the series with the Dunia Engine, built specifically for Far Cry 2 and the games to follow. Successive titles in the series would pit the player(s) against an expansive world full of hostile enemies rallied under the banner of some given antagonist(s); taking the step fully away from the pre-FC2 era of level-based story progression. World design aside, what captivated me so early on was the inclusion of a dynamic fire system and how that reshaped combat as we knew it within the Far Cry franchise. Granted, the series was always built on high-octane action filled with gunpowder and explosions, but a split-second after detonation there wasn’t any more danger for the player (or NPCs) to worry about. 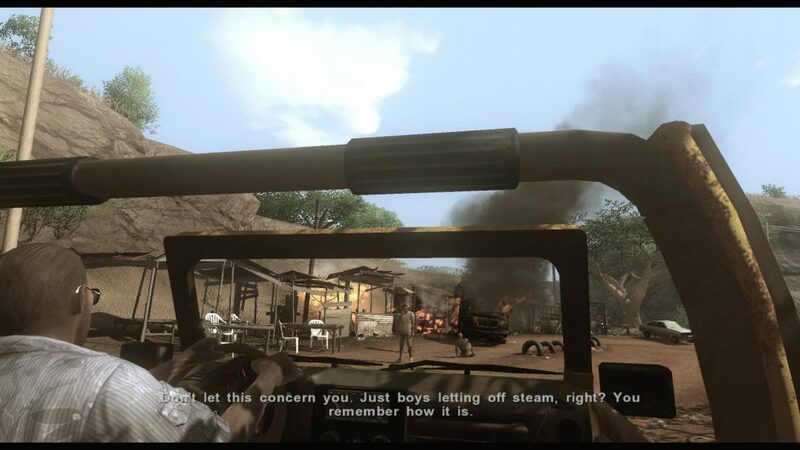 In Far Cry 2, the manner in which players engage their enemies shifts; taking into account both the environment and tools at their disposal. 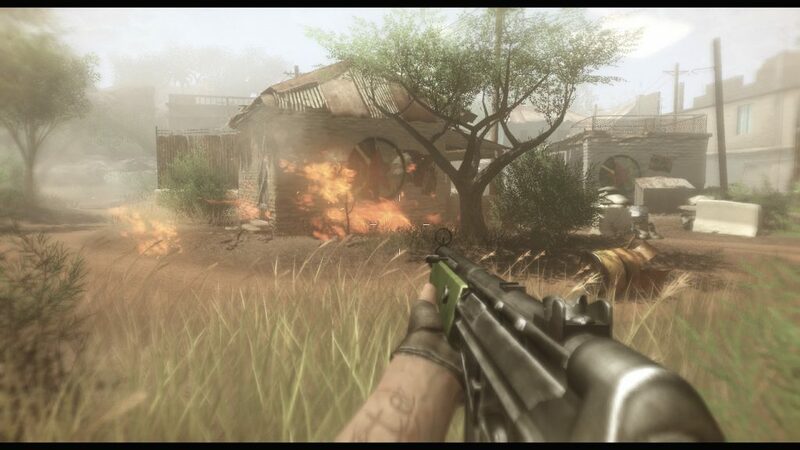 Though Far Cry 2 (2010) is beginning to show its age, it was a technical marvel for the ‘younger me’ to behold. I’d only encountered a handful of games before that point where the player was so free to take on the game and all its challenges so leisurely, and I often found myself exploring for diamonds (the game’s currency) or taking on some of the side missions that encouraged some sight-seeing. Right from the get-go, however, the game let me know that fire was going to be a big part of how my character’s day-to-day would unfold. On the ride into Leboa-Sako, the fictional country set in Central Africa, your cab driver speeds past a brush fire; sharing worries about wildfires that ravage the area. Moments later, you’re making way past a handful of blazing shanty buildings in the countryside and rebel soldiers standing around, assault rifles proudly in the air. Things calm down a little bit from there for the remainder of the introduction to the story, at least until hell erupts at your destination. Shambling about a small city with bullets whizzing around you, fire is again encountered whenever a nearby barrel or ammunition stockpile takes a hit, summarily erupting into flames that feed the propagation system. From that point on, fire feels ever-present, albeit benched on the sidelines until it is time to come roaring in. As noted above, I only recently installed Far Cry 2 to my Xbox One. As such, when I loaded into the game it was with a fresh save and none of the high-impact weapons I’d accumulated in previous playthroughs. Still, I knew that there would be a good place to take a look at how fire spreads within the game world. Off to Mike’s Bar, the ‘social hub’ of the first map you play in. It’s a perfect setup for demonstration; it has dry grass, trees, explosives, and perhaps best of all – an armoury to replenish the many molotov cocktails that I was sure to expend in my pyromanic research. For science. Examining the graphics below, you can see the before-and-after comparison of a single grenade toss’ impact. First, the grenade detonates the Jeep, which flips over and produces the fire’s point of origin. The flames jump to the dry grass, which spread out in an arc away from the road (the dirt is non-flammable), and begin to climb the small mound where a convenient fuel barrel sits behind a rock. The barrel explodes (of course it does), which fuels the brushfire anew. Carrying on past the other side of the rock and small barrier, the grass burns away and makes its way to a nearby tree. Once the flames are licking at the base of the tree, fire can be seen spreading across the foliage of the branches (trunks, for some reason, weren’t often found ablaze). Now, with fresh visuals in mind, I began to remember more vividly some of the encounters I’d had in Far Cry 2 all those years ago where the brushfires impacted the gameplay beyond a cosmetic display of flickering textures. It should go without saying, but seeing as how I haven’t directly mentioned it here – fire, in Far Cry, hurts. It remains the all-consuming force of nature that we expect it to be, and the engineering behind the Dunia Engine serves to actualize that reality within the game. Fire will ignite explosives, it will detonate vehicles, and it will eat away at health bars quite quickly (yours and NPCs alike) when characters are caught in the blaze. One such encounter (years ago) brought about all of the above in a quick succession, before the era of in-game screenshots or a capture card at home. In the southern part of the map (unlocked in the second half of the game) was a decent-sized building, featuring a train yard and many enemies with whom I was to be carrying out my mercenary business and put some rivals down in the process. I’d driven up to the facility and stopped just short, hoping to gain initiative from afar with my trust rifle. The beginning of the encounter played out like dozens had before it; I landed some headshots on unwitting enemies, only to be noticed and forced to shift the pace of combat. During the fight, some baddies hopped into a Jeep of their own and began closing the distance, quickly. About the halfway mark, a lucky grenade toss put an end to their pursuit, destroying the vehicle as well. With the engine block aflame, fire soon began spreading out in front of me, partially blocking my view of the building and the enemies within. It was around that time that reinforcements arrived from behind me along the main road. Vehicles with mounted LMGs began unloading, and suddenly I found myself flanked from both sides without a great deal of natural cover to mitigate the incoming damage. To make matters worse, what little unnatural cover I had (the vehicle) took enough hits to explode as well, marking the start of another brushfire. At this point, I had to content with enemies on two sides, and fires on two more. 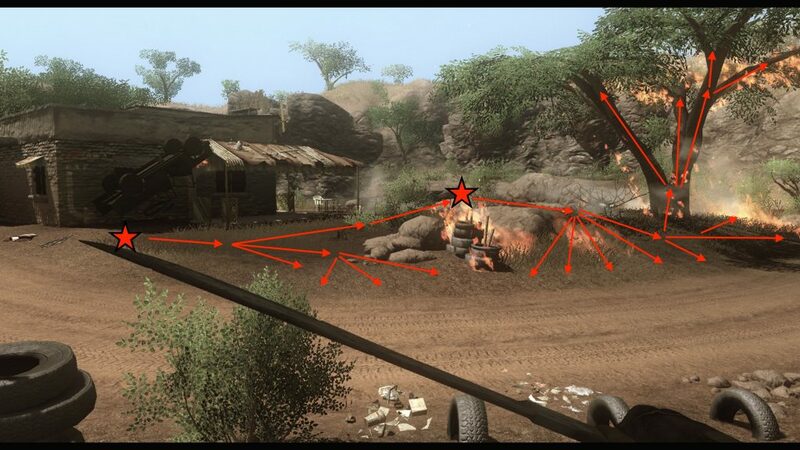 The AI wasn’t astoundingly clever in Far Cry 2, but it knew enough to swing wide around a fire in order to close range safely and engage the enemy without risking near-immediate death. I’m sure that in the following moments I used more than a few of my med kits (syrettes) to stave off my own demise, but then I made a risky move that ended up paying off; I jumped in to the fire, which had burned out in the middle where my own vehicle has started the blaze. With no more fuel to support the fire, I was standing inside a ring of it and able to crouch beside the burned-out husk of the Jeep I’d driven in. Now, better protected, I could pick my shots and set the pace of combat where my enemies were more out the open, unable to approach due the wildfires meeting up to form one larger blaze. The encounter was over rather briefly after that, and it remains one of my fondest memories of the game to this day. I had begun this writing by preaching about just how impactful fire was to the Far Cry franchise after its inclusion in Far Cry 2; what kind of impact does it have on later titles? Far Cry 3 is set in luscious, tropical, island territory, and both Far Cry 4 and Far Cry Primal are set in the partially-frozen mountains of Nepal – those geographic areas feature a great deal more greenery and ground-level moisture than the arid climate found in much of Far Cry 2′s African setting, and are certainly less prone to brush fires and tinderbox conditions. Though the environment is certainly different, much of what was built for the first Dunia Engine (used in FC2) was expanded upon for Dunia Engine 2 (used in FC3, FC4, and FC:Primal) and the fire propagation system remains in the day-to-day activities of the games’ protagonists. Those that have played the last few titles can affirm that there is no shortage of ways that the game injects fire into the open-world environments. Taking down outposts allows you to leverage the fire propagation by destroying (or throwing) explosives around the base, sowing confusion amongst the ranks and herding enemies to where they may be encountered more easily. Destroying a vehicle on the roads may set one side of the trail ablaze, forcing all parties into encounters on higher (or lower) grounds, away from the spreading flames. 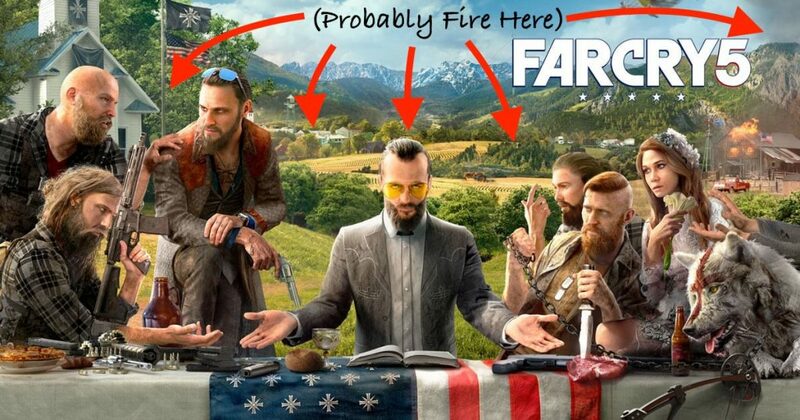 Regular life in the Far Cry world has been shaped by the inclusion of the ‘realistic’ fire and what it means for combatants that risk an open engagement around flammable material. Now, with Far Cry 5 looming on the horizon, only time will tell us whether or not to expect wildfires in Montana, the location of the next title. It’s probably a safe bet that they’ll be bigger and meaner than ever.